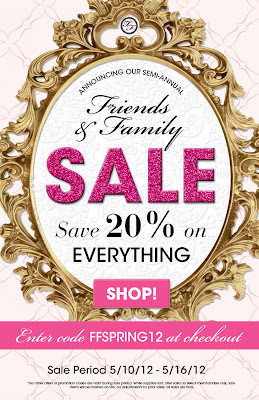 Too Faced is having their semi-annual Friends & Family sale where you can score 20% off products on their site. Use the code FFSPRING12 at check-out. The sale starts today and ends on May 16th. If you need shopping suggestions, I love the new Chocolate Soleil Milk Chocolate Bronzer and the Summer Eye Palette. The Matte Eye Palette and Naked Eye Palette are favorites of mine too.